The Florida Keys are all about fishing. 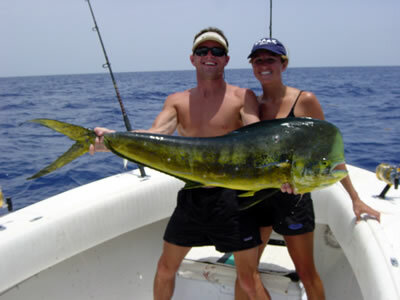 Whether you vacation here for the diving, the fishing, the partying, the beaches, or the total Keys experience, fishing will somehow work itself into your vacation one way or another. Even if you’re not an anger, you may find yourself strolling along Charterboat Row in Key West, eyeing the large fishing boats, curious and considering… Or you may cruise along the Overseas Highway from Key Largo to Key West, across all those bridges, and notice people setting up camp on the bridges to fish. You’ll see the giant piles of paraphernalia they’ve brought with them for a day of bridge fishing and wonder what the fuss is all about. They set up tents, bring buckets and rods rolling on specially-made handcarts, and seem to be having a ball. Or you may want to experience the satisfaction of catching a fish and eating it for dinner, something most people in this modern world will never do. Just to say you did it. The fishing is great in the Florida Keys. There are several ways in which you can participate in the joys of fishing. 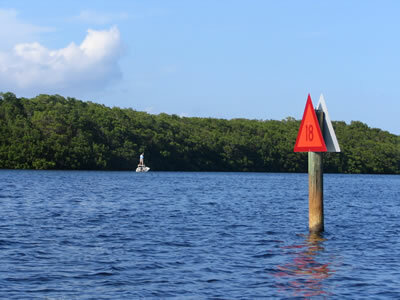 Charter fishing is the most obvious way for a vacationer to get out on the water and catch some good fish. Local guides on every Key know where to go, and they will supply you with everything you need, including a fishing license. Just show up at the dock with your lunch and get ready for some action. They’ll take you to the flats for some sportfishing for bonefish or permit, or you can charter a larger boat and go offshore. The bigger boats will go for sailfish, tuna, and wahoo, or they’ll bottom fish for grouper & snapper, which are the best for taking home to eat. When Dolphin (the fish, not the mammal) is in season, this is a superb eating fish as well. Charter fishing will run you about $6450 for a full day of flats fishing and up to $1000 for a full day on a 34-foot boat that can go offshore, and up to $1200 for the big boys you’ll see at Charterboat Row in Key West and other marinas throughout the Florida Keys. These are the giant boats with huge tuna towers on top, which can go way offshore. For booking a center console in Key check out FKF Charters. Party fishing boats are the budget-conscious way to go fishing. They run about $35 for a half day of fishing on a large boat. There will be other people on the boat, and you won’t’ get the personalized experience of a guide, but you will catch some fish. It’s a good way to try fishing if you’ve never had the joy. Fishing from a pier is possible in some locations in the Florida Keys, and many resorts will have their own pier, some reaching 200 feet out into the ocean. White Street Pier in Key West is another spot. Bridge fishing is completely do-it-yourself, and if it’s not allowed on a particular bridge, you’ll see the signs. Lots of the bridges have tubes where you can dispose of your used fishing line so it doesn’t end up in the water, strangling a bird or tangling a turtle. There’s good fishing on the old versions of many of the bridges in the Keys, where cars no longer go. Some old unused bridges are long and they’ve been kept up enough so that they’re safe for anglers. This is where you’ll see people setting up tents so they can escape the sun while fishing, or so their non-fishing family members have a place to hang out. If you want to target specific fish, talk to a guide before you go out and let him know. If you want to haul in a shark, make sure your guide knows about it beforehand. If you want to bag some fish for dinner, speak up and you’ll be taken to the correct spot for that, too. 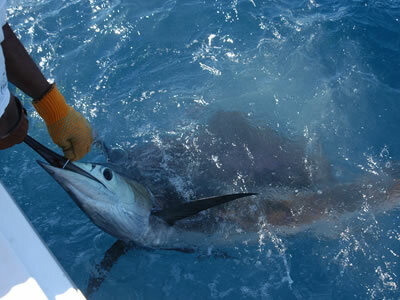 If you want to reel in a sportfish such as a sailfish, then choose a guide who will go offshore and troll for them. It’s all possible while fishing the Keys. The spiny lobster mini-season brings lobster-lovers from across the globe, so make sure to make your reservations and arrangements in advance. These lobsters roam the waters from Brazil to Bermuda, though a high concentration of them inhabits the Keys waters. Once you corner one, make sure your net or bag is in the right place before they jet off, because these crawfish escape by shooting backwards through the water. Bring your catch to most Keys restaurants and they’ll cook it for you, or order theirs and enjoy the taste without the work. Florida lobster are very similar in taste and texture to Maine lobster, only smaller. They’re great boiled, steamed, or grilled, and sold whole, as tails, and as meat in many local markets. During this time, there’s a ban on diving and snorkeling within 300 feet of marinas, canals, and private shorelines to prevent damage done by overzealous lobster hunters. There are bag limits, restricted areas, and gear specifications. For complete and up-to-date regulations, please call the Florida Fish & Wildlife Conservation Commission at 850-488-4676 . The commercial lobster season runs from August to March. Only commercial license holders may trap lobster & stone crabs, and Florida no longer issues commercial licenses. Existing licenses must be purchased from another fisherman. People often spear fish while lobstering.